The BNO080 Development Kit is a demonstration and evaluation platform for the BNO080 and BNO085. The BNO080 Development Kit is a demonstration and evaluation platform for the BNO080 and BNO085. 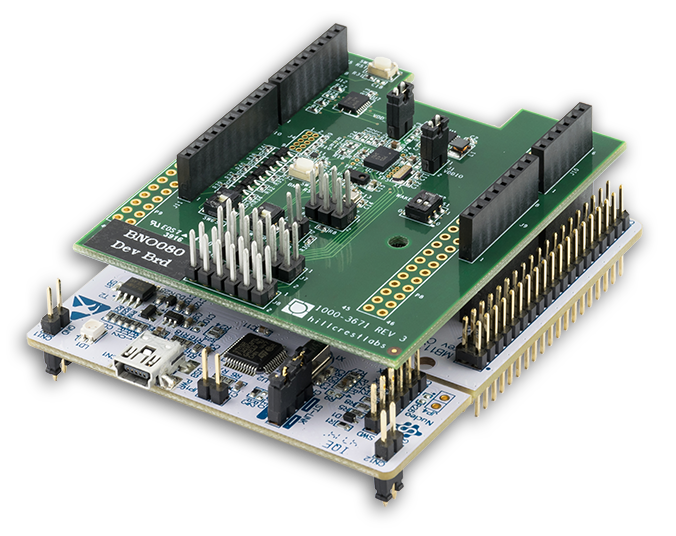 The development kit is designed as a ‘shield’ that can connect to open prototyping platforms such as the STM32 Nucleo (included with the kit). The kit allows the user to build applications that incorporate the BNO080/BNO085’s superior motion processing and power management capabilities. Full documentation including schematics and software examples for the two target platforms are included. BNO080 Development Board: 2.425" x 2.85" x 0.755"
BNO080 Development Kit (mounted on Nucleo): 2.75" x 3.30" x 1.37"